You have to see how this artist repurposes old Christmas trees. Don't know about you, but I always get a sad feeling when I see discarded Christmas trees after the holidays. Like a single glove without its partner, seeing those slowing dying trees littered on the sidewalks is a finite if not a little cruel end to the year. Lucky for us, artist Michael Neff is taking your unwanted trees and turning them into an awesome installation at the Knockdown Center in Maspeth, beginning this Saturday. 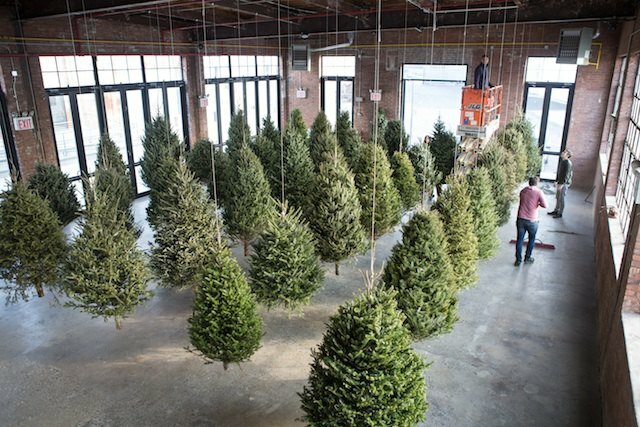 Neff's "Suspended Forest" features dozens of discarded trees he collected in Brooklyn displayed in the brick-walled warehouse-turned-gallery. "Suspended Forest has been shown twice previously in an unauthorized, unused space under the BQE along Metropolitan Avenue in Williamsburg. Those installations were removed by the city within days. The exhibition at Knockdown Center, on view for a month and configured in a grid, allows for a much different experience, most importantly time for the trees to shed their needles into halos on the smooth concrete floor below. Paired with the subtle pine fragrance of the trees and the opportunity for quiet contemplation, the exhibition encourages repeated viewing." "Suspended Forest" @ Knockdown Center, 52-19 Flushing Ave in Queens. Opening reception Jan. 9 5-7 pm. On view until Jan. 31 Sat & Sun 2-6 pm.